WASHINGTON -- The Trump administration has taken another step toward building a wall on the U.S. border with Mexico, even as funding for the project remains in question. U.S. Customs and Border Protection announced Thursday it will award contracts to four companies to build four concrete prototypes for the wall. CBP is providing few details of the concrete prototypes and says funding for four other prototypes for a see-through structure will be awarded next week. The prototypes will cost a total of $3.6 million and will be built in San Diego. 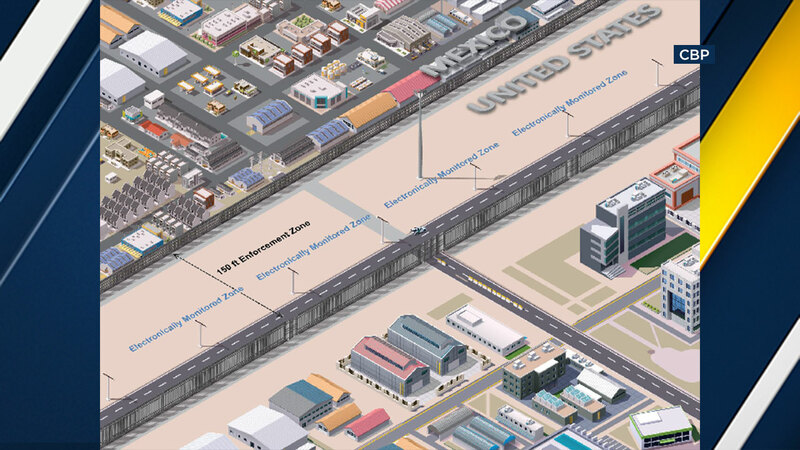 A rendering from the federal government shows what a proposed wall along the U.S.-Mexico border might look like. The four companies announced Thursday are Caddell Construction Co. of Montgomery, Alabama; Fisher Sand & Gravel Co. of Tempe, Arizona; Texas Sterling Construction Co. of Houston; and W.G. Yates & Sons Construction Co. of Philadelphia, Mississippi. Trump made the construction of the wall his signature issue in the presidential campaign. He promised that Mexico would pay for it, but Mexico has refused. Trump is now demanding that Congress fund the wall and has threatened to shut down the government if it doesn't do so.